It is nothing new to say that Jacques Pépin has been a personal inspiration for me. I wish I could be more original, but there it is. Watching him with Julia Child in their WGBH show Julia & Jacques Cooking at Home in 2000 was one of my earlier impetuses to start cooking and trying more foods to roust me from the picky rut I'd been in for 27 years. 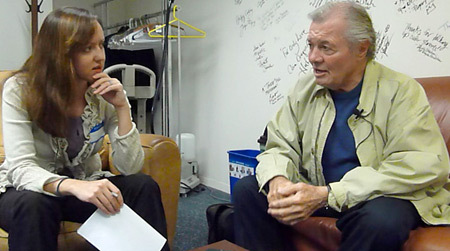 Seven years later while working with him on his KQED show More Fast Food My Way, Jacques said something to me around which I built an entire chapter of my first book. Today, I was able to hand Jacques a galley copy of that book and sit down with him for an hour to talk about picky eating, foie gras, and Paula Deen. I really wish I could write out Jacques' voluptuous accent phonetically without it looking like I'm making fun of him. His cadence is just so enchanting, it makes you want to sit back with a glass of slow-sipping Calvados, close your eyes, and simply listen to all his stories. Sadly, with no Calvados on hand and an interview to conduct, I jump right into our interview by asking Jacques to elaborate on something he wrote in the foreword of Essential Pépin: "The appetites of a young, middle-aged, and an older man are different..." Leaning back in the couch in KQED's greenroom, Jacques notes that as you get older your metabolism changes, but also that, "as a young chef, you tend to add to the plate. To add, to add, to add! And as you get older, you start to clean up, clean up, clean up the plate! Until you are left with the essential thing: that tomato right there, that olive oil, at that temperature." I wonder aloud if this a function of being a young chef, of trying to impress people. "It's a function of life," Jacques tells me and likens it to being a painter. "An artist is going to clean, a kind of a purification. You go through a process to get more to the essential of whatever you are working on." One could hypothesize that so-called picky children are like this. They start with the essentials, the simple foods, and later they will add more and more to that repertoire. When they are taking in so much information at once as they develop and grow, it makes sense that they would stick with foods that are comforting and familiar to them. Things they can count on. Some people, like me, might go into adulthood as a picky eater and, as I researched and detailed in my book, the reasons for why or how that happens are many. But concentrating on the picky children who seem to plague parents so much more today than they did back when my parents were raising me, I ask Jacques whether his daughter Claudine ever went through a picky stage. "Sure, absolutely!" Jacques responds instantly. "Claudine loved string bean stew and all of a sudden, she hated string beans. And I said, 'Fine, you don't have to eat it.' And certainly, she loved snails, because she was three years old and she loved garlic and the butter and all that too, until she was six or seven and then she's at school and her friends said, 'YUCK! You're eating that?' And that's it -- no more of them!" Jacques laughs and acknowledges that when kids reach a certain age, they want to conform to the other children around them. Like my parents, Jacques' approach to Claudine going off string beans and escargot was to shrug it off. It didn't bother him, and he didn't get upset about it. Additionally, when it turned out that Claudine favored more unusual vegetables -- artichokes and Brussels sprouts -- Jacques didn't make a big deal about that, either. "It's not like I went on my knees and said, 'Oh, my god!' No, we didn't even mention it. It doesn't even exist. It's there, you eat it. It comes, it goes." I mention my feeling that today's parents are way more worried about picky eaters than in the past and, along with this, they expect their children to have accomplished palates at such a young age. Jacques' response is that America is a country of extremes. We go from 15-hour dishes to 15-second microwave dinners, and that there was a time where food wasn't really discussed at the table. It was there and you ate it. However, now we have the opposite situation where we're discussing and analyzing everything and expecting our kids to do the same. "The kid is not meant to do that. No, the kid is just meant to enjoy the food, eat it, and that's it," Jacques pronounces. When Claudine was a child, Jacques use to take her to New York. Just the two of them. They would stay in a hotel and go to a movie, and after the movie, they would eat at restaurants like Brasserie or Lutèce. However, Claudine was used to all those fancy restaurants by the time she was six or seven, and on one visit, Jacques -- imitating Claudine's long-suffering tones -- says she asked, "Can we go to Burger King?" Jacques laughs and says his response was, "Okay, fine!" There you go, just like Julia Child proudly admitted her affinity for McDonald's fries, Jacques Pépin, the celebrated chef who cooked for the likes of Charles de Gaulle and who chefs today admire and revere, had no problem taking his daughter to Burger King. "The food follows your mood, follows the season, follows the ingredient. And don't talk too much, analyze it too much, just enjoy it." Laughing as he cites people's reaction to freaking out over putting butter on bread, Jacques explains, "I say, 'Look, if you don't want to eat butter, don't eat it. Because if you eat it, you aren't going to digest it the right way. Your gastric juices are going to come back and you're going to have sourness. Don't eat it if it disturbs you. You have to be happy. You have to be happy when you cook and certainly you have to be happy when you eat." As our conversation naturally turned from eating with kids to cooking with kids, Jacques told me that last week his eight-year-old granddaughter Shorey said to Claudine, "Mom, I think want to cook with Jacques." Claudine's response was, "Well, that's fine, darling, but I don't think you should call your grandfather Jacques." Shorey started crying and said, "I didn't mean him, I want to cook with Jacques Torres!" As Jacques pronounces this famous chocolatier's name, his voice chokes with appreciative mirth. I didn't intend to get into food politics, but after Jacques tells me his publishers thought skinning a rabbit on the DVD accompaniment to Essential Pepin was too traumatizing (adding that if he killed and skinned a rabbit on stage, "I would probably be assassinated more than if I killed my wife! "), Jacques himself brings up the California foie gras ban. "They have no idea what they are talking about. And the worst is that they are righteous," Jacques announces. Stating that no one would pass a law banning the large industrial chicken farms that abuse their poultry with beak trimming and other atrocities, Jacques details that the way foie gras-destined ducks are treated is actually a "natural process" that both the Ancient Egyptians and Romans practiced long before the French came along. Way back then it was discovered that when a duck or goose was killed at migration time, the liver was twice as large as normal. Additionally, it was noted that after migration, the liver shrank down again. Jacques explains this is the liver's reaction to the overeating that is necessary for sustained migration. The Egyptians and Romans learned they could overfeed the ducks outside of migration and achieve this same affect. "But if you've been on a farm," Jacques explains, "the first day the duck is a little surprised when they put the [gavage] in and give him the mush...but after one day, they come to get it." Jacques continues that the animal does not suffer, and that, in fact, there can't be any trauma whatsoever, because if the animal is traumatized, it actually compromises the quality of the liver. That discussion emboldens me to get his opinion on another hot button food topic: Paula Deen. Reminding him that Anthony Bourdain once called Paula Deen "the worst, most dangerous person to America," I ask Jacques whether Deen's recent diabetes diagnosis was really any of the public's business. "No, it's not right. That's the way she cooks -- just like many other people in the South, like me occasionally -- and this is a condition people get. Who knows, if she lived in Provence and cooked the Mediterranean way that she wouldn't have the same condition anyway? We are cooks, we aren't doctors." As to whether or not Deen and others have any responsibility to their viewers, Jacques explained, "I have 700 recipes and of those, some are classic French recipes and are plenty rich. I have no choice what people are going to cook. I have no choice in how much people are going to drink." Jacques chuckles that people freak out when he tells him he and his wife Gloria drink two bottles over dinner. "Well yes," he details, "I start cooking at 4:00 in the afternoon and I open a bottle of white wine and by the time we eat at 7:00, we've finished that bottle of white wine and we open a bottle of red wine." Jacques concludes this by saying he's recently decided to exclusively buy magnums of wine. "So when my doctor asks, I will say, 'Oh, I only drink one bottle.'" A contributor to Bay Area Bites since its inception, Stephanie V.W. Lucianovic is a Bay Area food writer and editor. 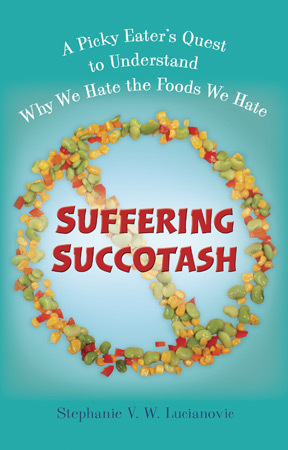 Her first book Suffering Succotash: A Picky Eater's Quest to Understand Why We Hate the Foods We Hate is a humorous non-fiction narrative and exposé on the lives of picky eaters. It releases from Perigee Books July 3rd.